What is an assignment window (AW)? What is the second opinion request? Why does APNIC require the second opinion requests? Do I need to send in a second opinion request for assignments to my own infrastructure? Can I assign more than my assignment window? What size assignment window is given to new members? How long do I have to wait before my assignment window increases? How long do I have to wait to a second opinion request to be approved by APNIC? What will happen if I do not follow the second opinion process? An AW refers to the amount of IP address space that you can assign or sub-allocate to you customers without the need to send in a second opinion request form for APNICs approval. Your organization has been given an assignment window of 0 IP addresses. Therefore you cannot assign an IP addresses to your customers without first receiving approval from APNIC. Your organization has been given an assignment window of 32 (/27). Therefore, you can assign up to and including 32 IP addresses without the need to seek approval from APNIC. However, if a customer requests more than 32 IP addresses, you must first seek APNICs approval. A second opinion request is the process that is used to seek APNICs approval for assignment or sub-allocations that exceed your assignment window. On the second opinion request form you outline how you are going to assign IP addresses to your customer networks. The information you need to supply on this form is similar to what you need to provide on the IPv4 ISP Request form except that the second opinion request relates only to customer assignments and sub-allocations, not assignments for your own infrastructure. You must receive APNICs approval of the second opinion request before you can make assignments or sub-allocations exceeding your assignment window. APNIC applies the assignment window and second opinion process to all members. This is to ensure that all members are familiar with APNICs policies and follow the correct procedures and practices when assigning IP addresses. See [APNIC-127] APNIC Internet Number Resource Policies for more information. No, you do not need to send in a second opinion request for your infrastructure; however, you do need to ensure that you assign IP addresses conservatively and only on justifiable technical needs (not simply for administrative convenience). Note, when you wish to obtain additional IP addresses from APNIC, you have to demonstrate that you have used 80 per cent of your previous allocation in accordance with APNICs policies. Yes, you can assign or sub-allocate as many IP addresses as is necessary for your customers to implement their networks. However, before you assign or sub-allocate to your customers, you must submit he second opinion request form and receive APNICs approval. All new members will be given an assignment window of 0 IP addresses when they first join. As the member gains experience, this will be raised. Whether the second opinion form is always completed with the details necessary for APNICs hostmaster’s to evaluate it without requesting additional information. Whether the member has been correctly and accurately updating previously approved second opinion requests in APNICs database. All requests sent to APNIC will get a reply within one working day (Monday-Friday). This does not necessarily mean that your requests ill be approved the first time as this depends on whether your request is complete, accurate, and contains sufficient information for APNICs hostmasters to understand and evaluate. Read the second opinion request form carefully and obtain all the necessary information from your customers before submitting the form to APNIC. APNIC will request an explanation as to why you have not followed the second opinion process. Provided your explanation is reasonable, APNIC will continue to allocate resources to your organization. Depending on the circumstances, APNIC may also advise you of nay action that may be taken if your organization does not follow in future. upstream once this request gets approved. 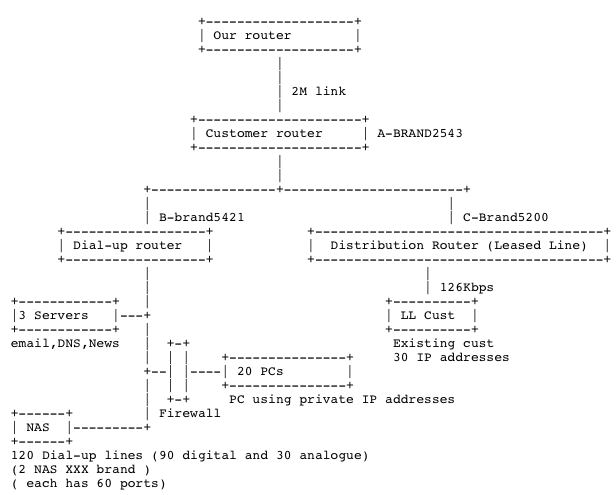 Below is a diagram on how the customer will connect to the ISP's network.